If the pandemic currently affecting Milan fans world wide is called “Year Zero” by Allegri and the club, then today I thought I would look at “Patient Zero.” Every pandemic has an origin, and if this new “Budget Milan™,” made up of players not ordinarily considered qualified to wear the Milan shirt is the disease, there must be an origin for this disease. 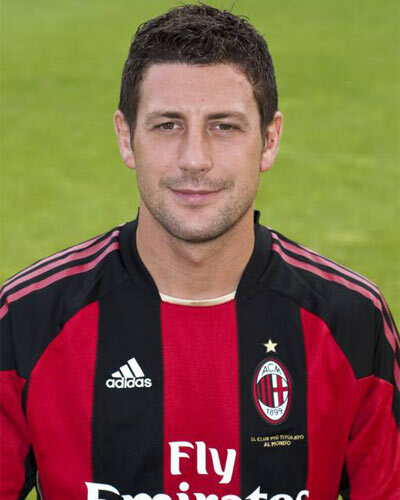 A player who infiltrated Milan and singlehandedly brought down the quality level. Of course, everyone must realize by now that I speak of Daniele Bonera, Patient Zero. At first glance, he seems innocent enough. He’s charming, well-behaved, hard working, and a great teammate. In fact, he is so convincingly Milan, many people are under the impression that he’s a Milan youth product. But he’s not. He spent his youth and first three years of his senior experience in Brescia, actually, and didn’t even come to Milan until 2006, after spending four years at Parma. His career is defined further by the fact that he is a one goal wonder. Literally, in 283 first team appearances for three different teams, he has scored one goal. And none in his 50 appearances with the U21, Olympic, or Senior National Teams. Not that center backs typically have a lot of goals, but one is still a very low number for so many appearances. He is quite literally a one goal wonder. But the sinister part is his incredible ability to fail. Over and over and over. Every once in a while, he will put in a decent performance, usually against the world’s best players, just to convince that he is Milan caliber. But Milan fans know differently. He is slow to react, his tackles rarely succeed, he is often out of position, he has been known to get in the way of the keeper or other defenders, collects fouls and cards, but mostly, he is particularly adept at allowing goals. His is a terrible, terrible disease, one that should have been contained long ago. But it wasn’t. So here we are at Year Zero, and now his disease has affected nearly the entire team. Not only did his terrible skills scare off 14 Milan quality players, but his disease spread throughout the mercato. We brought in players from mid-table and relegated Ligue 1 sides. We brought in a player with Serie B and Lega Pro credentials. We brought in a player from a relegated La Liga side, and a Roma reject, too. The pandemic has no end. Not sure if tackles from behind are legal, Bonera? The pandemic also spread to the fans, who are cynical and angry and feel hopeless about the future. Yes, Bonera’s failure is Milan’s failure, bringing down the quality of play so low that fans didn’t even buy their season tickets. Or merchandise. Who would buy the jersey of Patient Zero? Or of any of his diseased new teammates? The failure is so widespread that many feel it has affected the coach and the management, too. But hope is on the way. There are a few players who have resisted the disease, and a couple of new signings that also seem unlikely to develop it. There are some fans who are hopeful, and some who are even still buying merchandise and tickets. Perhaps the ability to contain and conquer this pandemic lies within our reach after all. Yes, I think if we look to Patient Zero, we will find the answer. If Allegri can find it within himself to bench the one-goal wonder, I believe the failure he has spread everywhere will be contained, maybe even cured. Some players bring out the best in their teammates, unfortunately, Bonera brings out the worst. So to make this sacrifice for the team would be the least he can do if he truly is a Milan player. After speaking to the Center for Disease Control, they agree. Isolating patient zero is the first step in stopping a pandemic. Once he is isolated, a cure can be found, and Milan can be rid of the pandemic and truly compete for the Scudetto with the full support of their fans. Allegri, it’s your move. Help us stop the pandemic. Bench Patient Zero. For the good of Milan everywhere. bonera budget milan™ girl rant how do you solve a problem like antonini? mercato mesbah milan milan legends need a miracle one goal wonder?